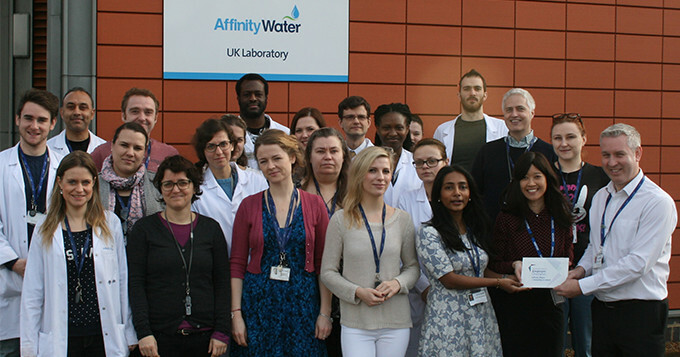 The Science Council visited Affinity Water’s laboratory in Staines today to present them with their Employer Champion plaque. Employer Champion status recognises Affinity Water’s commitment to championing the values of professional registration and supporting their scientific staff through the registration process, for those who are eligible, as well as recognising staff who become registered. As the largest water-only supplier in the UK, supplying a population of more than 3.5 million people each day, this commitment is also a guarantee to the customer that their water is being tested and treated by professional scientists at a high quality and standard. Affinity Water is also a CPD Approved Employer, which recognises their provision and access to CPD opportunities for their scientists and science technicians.